""If they had let me on white radio stations back then, there never would have been an Elvis"
Elvis Presley Enterprises kept music legend's memory alive to tune of $40 million in 2004. OK, maybe not in the actual, medical sense of the word, but from a sales and marketing perspective Elvis is almost as hot today as when he first shook his scandalous hips on the Ed Sullivan show in 1956. The beauty of Elvis is that there are so many facets to him," said Scott Williams, the marketing manager for Elvis Presley Enterprises, the name of the company that oversees business operations of the Elvis estate. Williams was in town yesterday speaking to the Nashville Advertising Federation, a local industry group, about how to market a rock legacy long after the celebrity himself has died. "What we want to do is let fans enjoy Elvis in their own way," he said. 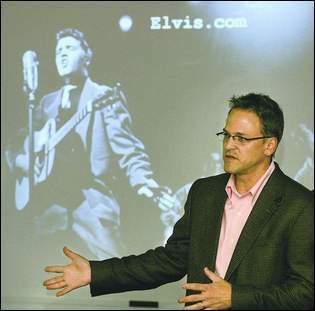 Scott Williams, marketing manager for Elvis Presley Enterprises, speaks to the Nashville Advertising Federation at Scarritt-Bennett Center about how to market a dead music superstar’s legacy. Translation: Whether you like Elvis solely for his music, for his movies, for the kitsch factor — or better yet, for all those reasons, Williams' job is to offer plenty of innovative ways to meet that demand. And judging from the numbers, it's a business strategy that's working. Last year, EPE brought in roughly $40 million, making Elvis No. 1 on Forbes magazine's 2004 list of the top-earning dead celebrities, ahead of Peanuts creator Charles Schulz and Lord of The Rings author J.R.R Tolkien. In February, New York-based company CKX acquired an 85% stake in EPE from Presley's daughter Lisa Marie Presley for roughly $108 million in cash and stock, according to SEC filings. In addition, the company paid wife Priscilla Presley $6.5 million and annual payments of $550,000 for the next eight years for commercial use of the Presley name. A month after buying EPE, the company purchased 19 Entertainment, the company that created the Pop Idols television franchise. Already, Williams hinted, the sister companies are working together, as Graceland recently hosted the top four contestants on Canadian Idol, footage of which became great fodder for Elvis.com. Elvis.com, which draws 600,000 unique visitors per month and drew 1 million during August, the month Elvis died, keeps its audience engaged with such mundane technologies as a Webcam on the property and message boards." The Webcam is the second-most-popular destination on the site aside from the home page," Williams told the roughly 50-person crowd. "We've even gotten e-mails from people telling us, 'I just saw shuttle bus No. 403 pull up. The right brake light is out.' I'm not making this up." But there's also plenty of licensed merchandise offered online as well. Everything from an $87 wallet from fashion designer Paul Frank to the $199 Elvis Super Deluxe jumpsuit. CKX's latest quarterly earnings report indicates that of its $18.9 million in revenue, $10.3 million derived from royalties and licensing. Elvis licensing is such a big business that a full-time staff of 10 people does nothing but handle licensing deals. And yet, despite having about 400 ongoing licensing partnerships, a full 98% of proposed Elvis projects are rejected each year, Williams said." Said Williams: "We're very careful. We only do licensing deals that make sense with the Elvis image."